OXFORD, Miss. 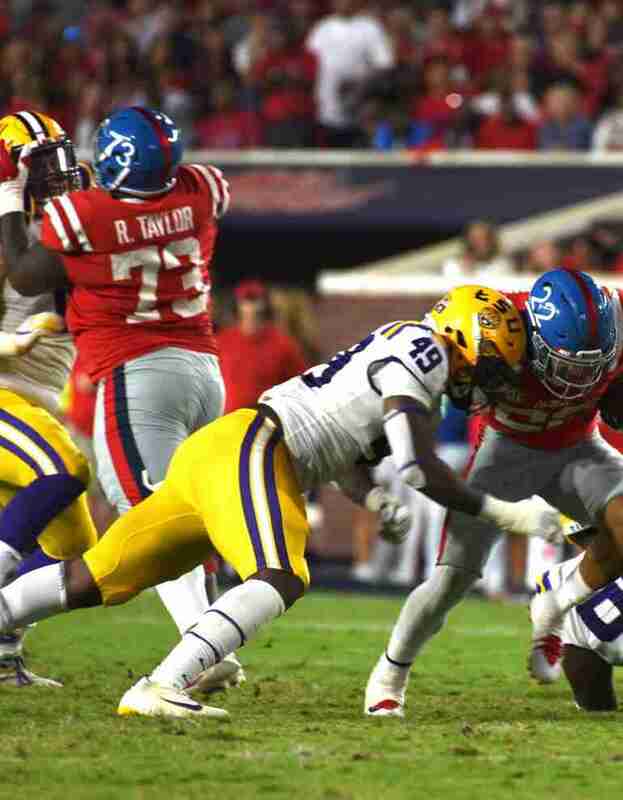 — For the last two years, Cincinnati has missed the postseason, in part because of the team’s weakness in the areas of pass and rush protection; however, the Bengals helped their offensive line in this year’s NFL Draft by selecting Ole Miss’ Rod Taylor in the seventh round. Rod Taylor blocks for Jaylen Walton against Vandy in 2014. Due to a lack of production from their offensive line, the Bengals’ offense finished last in the NFL in 2017 in total offense (280.5 ypg) and 26th in points per game (18.1). Cincinnati quarterback and seven-year veteran Andy Dalton saw a drop in his QB rating from 91.8 in 2016 to 86.6 in 2017. His passing yards took a hit as well, shrinking from 4,206 in 2016 to 3,320 in 2017. Dalton’s number one target, wide receiver A.J. Green, finished the 2017 season with 1,078 receiving yards and eight scores on 75 receptions, but neither his stats nor Dalton’s were enough to get the Bengals back into the playoffs. Before the start of the 2017 season, the Bengals allowed one of their best offensive linemen in franchise history, Andrew Whitworth, along with another standout lineman, guard Kevin Zeitler, to leave as a result of free agency. Compounding matters for the Bengals, the organization’s 2015 first-round draft picks Cedric Ogbuehi and Jake Fisher weren’t as productive as Cincinnati had hoped. In hopes of shoring up its offensive line, the team recently traded for left tackle Cordy Glenn and drafted Ohio State center Billy Price in the first round of this year’s draft. Taking Taylor in the seventh round is a steal for the Bengals, especially considering his ability to play multiple positions on the offensive line. Rod Taylor blocking for Ole Miss quarterback Chad Kelly in 2016. 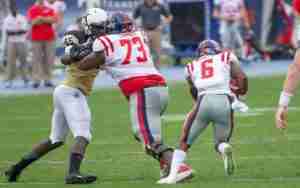 Taylor, who made 23 starts for the Rebels, started every game at right tackle last season after spending time at left tackle in 2016. Additionally, the Jackson, Miss. native started at right guard in his first two collegiate seasons, a spot where many think Taylor will play in the NFL. Simply put, his versatility is one of the attributes that made Taylor so appealing to the Bengals, and he could be slotted into the right guard or right tackle spots, should he play well this summer in training camp. As for Taylor, he doesn’t care where the Bengals use him. “It really doesn’t matter. I’m really comfortable at both (positions) because I’m used to them,” he told the Cincinnati Enquirer. At Ole Miss, Taylor helped anchor an offensive line that excelled under Rebels’ first-year offensive coordinator Phil Longo; in 2017, Ole Miss finished fifth in the Southeastern Conference in total offense (462.33 yards per game) and first in passing yards (3,941). Standing at 6-foot-3 and weighing 320 pounds, Taylor brings both depth and speed to Cincinnati’s offensive line. He improved his draft stock after an excellent showing at the NFL Combine where he ran a 5.25 40-yard dash, catching the eye of the Bengals. Taylor will be looking to make a good impression on Cincinnati head coach Marvin Lewis and new offensive line coach Frank Pollack. If he progresses as he has the talent to do, Taylor could find himself in the offensive line’s rotation, playing alongside Price and Glenn. 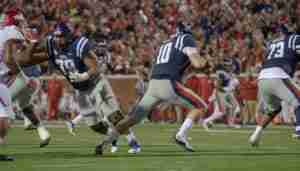 In addition to Taylor, three other former Ole Miss Football players were selected in this year’s draft. Breeland Speaks was selected in the second round by the Kansas City Chiefs. The Carolina Panthers drafted Marquis Haynes in the fourth round. Running back Jordan Wilkins, who became the fifth Rebel in school history to rush for 1,000 yards in a single season, was taken in the fifth round by the Indianapolis Colts. Wilkins was one of two backs drafted by Indianapolis on Saturday, joining N.C. State’s Nyheim Hines. Daronte Bouldin has signed as an undrafted free agent (UDFA) with the New Orleans Saints, while A.J. Moore has also signed as an UDFA with the New England Patriots. This is the third consecutive year the Rebels have had at least four players drafted. For all, it is the fulfillment of a goal they have worked years to achieve. “The dream came true, baby. Thank you Lord,” Taylor said.